Satan knows something that most of us fail to consider: human beings are the crown of God's creation. It is this position of honor in all the cosmos that draws Satan's ire. · What does our existence mean to God? · What does it mean to Satan? · How can we stand strong in the warfare raging around us? It is time to stop letting the enemy dominate our lives. The battle can be won as we stand strong in our awareness of who we are. The enemy knows. Do we? 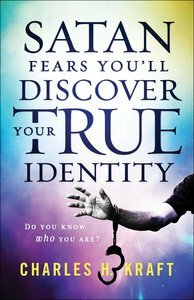 About "Satan Fears You'll Discover Your True Identity"
Charles H. Kraft (Ph.D., Hartford Seminary Foundation) is Sun-Hee Kwak Professor of Anthropology and Intercultural Communication in the School of Intercultural Studies at Fuller Seminary, Pasadena, California. He is the author of Christianity in Culture; Deep Wounds, Deep Healing; Defeating Dark Angels; Anthropology for Christian Witness and Communication Theory for Christian Witness. He has served as a missionary in Northern Nigeria, a professor in African languages at Michigan State University and UCLA, and part-time professor of anthropology at Biola University.